Bereaved Jadon Sancho fired Borussia Dortmund nine points clear at the top of the Bundesliga on Saturday with a late winner in a 2-1 derby triumph at Schalke, while a Robert Lewandowski double against Nuremberg lifted champions Bayern Munich up to second. 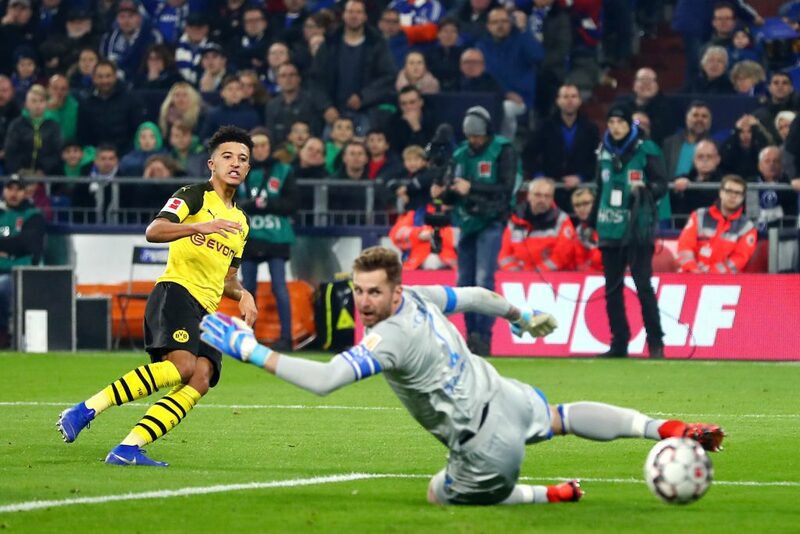 England winger Sancho, whose grandmother passed away in mid-week, slotted the winner 15 minutes from time in Gelsenkirchen to seal Dortmund’s first away derby win for five years and maintained their unbeaten start to 14 league games. “The goal was for my grandmother,” Sancho told reporters after netting his sixth goal of the season. Thomas Delaney’s seventh-minute header for Dortmund was cancelled out by a Daniel Caligiuri penalty just after the hour mark before Sancho struck following a beautiful one-two with Raphael Guerreiro. “The second goal by Sancho was worked out incredibly well – we do things like that in training,” said Dortmund captain Marco Reus. Dortmund looked set to easily get their fifth straight league win when Delaney found space in the congested area early on to head home a floated Reus free-kick. However Schalke drew level on 61 minutes when the video assistant referee judged that Reus had fouled Amine Harit in the area and Caligiuri banged home the resulting spot-kick. Sancho made sure that Lucien Favre’s side would when he hit the winner, racing through in the box after trading passes with Guerreiro and tapping home, before pointing to the heavens in celebration and disappearing under a pile of team-mates. Bayern moved two places up into second above Borussia Moenchengladbach after an impressive 3-0 home win against Nuremberg, with Lewandowski scoring twice in the opening half-an-hour before Franck Ribery sealed the points 11 minutes into the second half. Bayern will drop back to third if Borussia Moenchengladbach beat Stuttgart at home on Sunday.